Vibe motor circuit with Arduino => http://learningaboutelectronics.com/Articles/Vibration-motor-circuit.php. I guess I received an implicit answer to my question. Shortly after I posted this comment the name of the item changed from "Vibration Motor - LRA ROB-08449" to "Vibration Motor ROB-08449". I will continue my search for an LRA motor elsewhere. -*************** - I need an LRA (Linear Resonant Actuator) coin cell vibrating motor for a project. The name of this item indicates it is an LRA, "Vibration Motor - LRA ROB-08449" but the item description and the Datasheet indicate that it is actually an ERM (Eccentric Rotating Mass) coin cell vibrating motor. Does anyone know for sure which type it is? I need the vibration to be in the Z-axis. ERM's have vibration in the X-axis and Y-axis but nothing in Z. Plus an ERM type motor runs with a DC voltage. An LRA type motor requires an AC voltage tuned to the resonant frequency of the motor. An LRA type motor does not have a 'commutator' or '4 magnetic poles'. LRAs use a voice coil design with a single rare-earth magnet. LRA coin cell vibrating motors do typically cost a bit more than the ERM version so the relatively high price that Sparkfun is asking makes me think this might be an LRA (in which case the description and datasheet need to be updated). Glad you brought this up, I had exactly the same question. I will assume it is an ERA. Sparkfun, it would be really helpful if you clarified which type of motor this is. What material is the casing made from? I can't find it in the product sheet. I assume either aluminum or steel, but can't tell which. If anyone wants to see a good project done with this circuit, see How to Build a Vibration Motor Circuit. This shows you how to connect it directly to a voltage source to power it directly and how to integrate it with an arduino to allow the motor to vibrate every minute. I'm just curious why the similar part from Adafruit is so much less expensive. 1.95 vs 4.95.
if im making a vibrobot that requires other components to run at 6 volts, can i just use PWM to power these without burning them out? Can these be run continuously? How long might it last? Please consider updating the images to show the front and back along with a scale. Please consider reading the datasheet. Good motor, but I found that this coin motor which has same size and specs has about a 25% longer lifetime. Does anyone know of a good PCB mount for these? After reading a Fitbit Flex teardown I felt compelled to find one. Here is an image showing such a mount from ifixit.com's Fitbit Flex teardown step 8. I'm a little late, but since these are adhesive-backed, what's worked for me is just sticking it onto an empty section of the board. Thanks for the reply - I'm designing a wearable so real estate is a premium, was hoping to have it elevated above some circuitry to save board space, similar to how it shows in the image provided. Any ideas on how to do this consistently and reliably (w/o just sticking it)? Does anyone know if these will work for bristle bots? Are these comparable to the motors in cell phones? For the curious - these motors are great but they have very tiny, flexible leads that don't work well with a regular breadboard. I needed to solder solid-core jumper wires onto them to make a bunch of these robots, and wanted to use heat-shrink tubing to cover up the solder connections. I don't have a heat gun, and using a hair dryer with just one of these tiny motors is a pain (they're so light that they blow around) - let alone two dozen of them. Solution? Stick them in the oven! I checked with tech support and they said a different carrier had a data sheet with a maximum recommended storage temp of 70C/150F. The problem - the temp for the heat shrink tubing is 212F. The question - will that destroy the motor? Answer - as far as I found, no. I stuck one in the oven with heat shrink tubing at 200F, then got impatient because the tubing didn't seem to be shrinking enough and tried 215F. Checked the motor afterwards and it still worked fine. Then I got really brave and tried 250F to shrink the tubing a little more, and the motor STILL worked. Of course the caveat is that I didn't do a long-term test, so I'm not sure if this will affect the lifetime of the motor, but at least it didn't destroy it right away. can i connect that to a frequency generator and make it vibrate in range of 300hz to 5.0 khz ? No, that will just make it vibrate weakly. PWM will change the power delivered to the motor, not the speed at which it rotates. you can also use the MAX1749 to drive it from a source of up to 6.5v input. The output is adjustable with 2 resistors so you can easily provide 3v from sources greater than 4v. I plan on using a PNP transistor with 3.7v Li battery and count on the 0.7 voltage drop of the CE junction (like driving a relay). can also PWM the output to get less power to the motor. Bought with a Battery Holder 2xAA with Cover and Switch. Wired it directly and it gives off quite a bit of vibration. There is a noticeable difference between 2.4v (two rechargeable AA I had) and 3v (2 Duracell standard AA), so consider that you get more out of this little motor when you are higher in it's voltage range. What is the best way to vary the intensity of the vibrations? Use a PWM output from a 555 or micro-controller to drive it through a low-voltage MOSFET. I like NXP/Philips PMV30UN. Do i need to have software for it or can i just put a battery to it????? Two alkaline batteries in series will will work great. 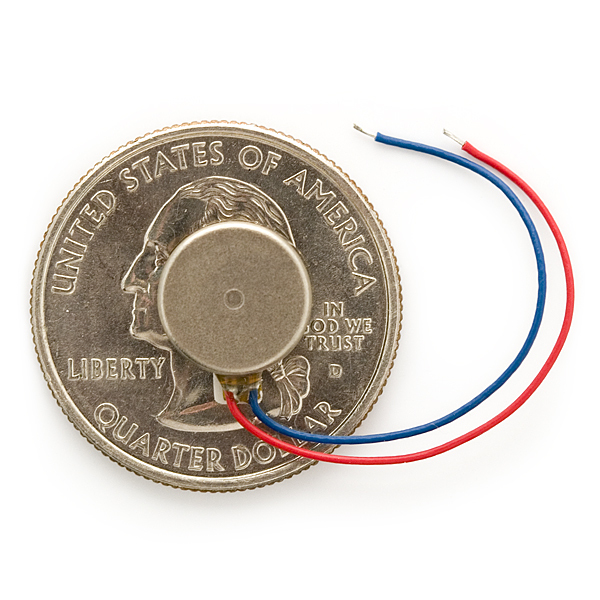 A single lithium "button" cell (e.g. a 2032) will work too, but it won't last as long. No software required. Weak! As far as vib motors go, its small and cute. The factor is nice. However, the vib itself is weak. On its own its mildly amusing. Attach it to anything (like 2 'AAA's) or put a small case around it and its hardly noticeable in your pocket. From my experience with it, depends on your current supply. if you does not worry about power, it can draw around 50-70mA max. I am very impressed about its vibration intensity at this current. definitely noticeable in my hand or against a hard surface. How strong of a vibration does this make? whats the best way to connect this, i m talking about the wiring, I need to be able to sit on these, one end will all get connected to a bread board and I will be using long wires. Can I use this with the LilyPad without any additional hardware? The LyliPad version of this motor cost $10 more. Thanks. the lilypad vibe board contains a small (33ohms) resistor and a Diode. these components are for safety and not required (but highly recomended). The diode works like a surge-protector. It is super-important if you are going to drive the motor using a microprocessor, motor controller, or transistor. Without the diode you could easily destroy these. (It's no fun toasting your Arduino). You don't need the diode when driving the motor directly with a battery, or through a switch. Most microprocessors have relatively weak outputs (20-25mA). The 33 ohm resistor in series is there so the motor doesn't draw too much current from the microprocessor. It's not needed if you are using a motor controller. I incorporated this vibration motor into a little pet project I've been working on and have got it to the point that it works good enough for me. I'm an experience programmer (mostly C/*nix) but am interested in the embedded world. I used this motor with an attiny85 (for timing) and a few other components to make a 'mouse mover' (doesn't actually move the mouse) aka 'executive override'. I work from home and company policy mandates the screen lock after ten minutes. This is darn inconvenient when just monitoring for email. This device will move the cursor about every four minutes, freeing me from constantly moving the mouse myself. I power the device from a USB port. I burned out a couple of the motors before I realized the voltage was too high. I moved the motor to source side of the mosfet and the voltage drop across the mosfet was enough to protect the motor and still provide stable operation. Below is a video of the final product. It is messy looking but has been working reliably. The vibration motor translates to cursor movement by moving an image just below the mouse. The large buypass capacitor (+ to ground) wasn't the best choice because the attiny85 keeps running on it for a while after the USB is unplugged. The video is about a minute long. Thanks SparkFun, I learned how to program the attiny85 with all of you online resources. I was super excited to build a bristle-bot with my 3 1/2 year old. It lasted only 3 minutes. One hit on the floor and the vibration motor came apart in pieces. Her first robot, dashed. Bummer. vibrates well for its size. comes with a adhesive back to lodge it to wherever you want. The product is loud and noticeable, definitely what I wanted. Great performance for the size. It has a decent kick and it very thin, compared to the ones I got from another supplier. Nice adhesive tape to stick it to anything you want. I cannot find any fault with it. I plan to use this vibration motor in a larger project and I think it will work fine. I didn't know such a thing existed until i saw it in your online catalog--so it was sort of a 'found' solution. The plan was to attach this motor to a bite-size candy bar and place it in a bowl of candy for Halloween. A light sensor activates the motor when a trick-or-treater reached for the candy. The motor wasnât strong enough to cause the candy to jump as much as I liked so wrapped styrofoam instead. Now it really hops. Received the motor in a timely way, works great !. If you need one buy it from sparkfun ! The wires at the end break too easily and some motors just stop working. Either SparkFun has a lot of defective units or these motors just break too easily. I only need 5 but had to buy around 12 just to finish testing some things. I found other vibration motors online from other suppliers and will try those because these were just so bad.